Immortality, it was understood in the Age of the Golden Eagle, is potentially attainable at any moment by a thought released from the three-dimensional world, escaping thereby from the illusions of time and space. Written between 1895 and 1912, Gaston de Pawlowski's Journey to the Land of the Fourth Dimension predates by almost 20 years Olaf Stapledon's Last and First Men. 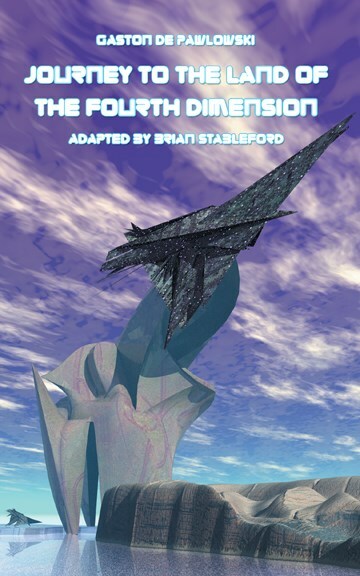 In this prodigious future history, we shall visit the singular era of the Leviathan, when a colossal entity enveloped men like cells in a gigantic body, the time of the Scientific Tyranny, when the Savants ruled supreme, and finally the Great Idealist Renaissance, or Age of the Golden Eagle, when the fourth dimension becomes familiar to all men. We shall meet homunculi and supermen, intelligent machines and giant microbes. "Much primitive futuristic fiction now seems banal and unadventurous in its anticipations, but there is nothing banal about Pawlowski's future history. The surreal quality of his futuristic vignettes-especially those dealing with "atomic dissociation" and future biotechnologies in the Scientific Era-has been given an extra edge by actual advances in modern science." Brian Stableford. This volume also contains the preface to the 1923 edition by Pawlowski in which the author explores and attempts to come to terms, philosophically and scientifically, with the impact of Einsteinian physics upon his work.